The drone photo shows leader Firefly last evening with reasonable trade winds at their back. 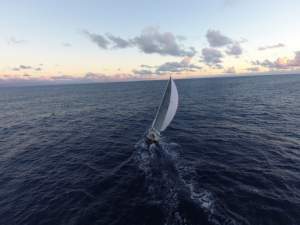 They and all the boats on her tail are reporting winds over the port stern at 15-18 its and making good speed for Maui with Firefly, Joy Ride and Kraken all racking up over 200 miles in the last 24 hours. It is simply astounding that at this stage in the race, competition for Line Honours, First Overall and First in each of the Racing Divisions are all still up for grabs with the above boats joined by Salient and Turnagain in the mix. Getting the angles right for this final 400 miles mad dash will be critical for trophies, bragging rights, and the coldest mai-tais. With only 404 miles to a project finish on Saturday morning, Firefly has maintained a slim lead of 29 miles over Joy Ride. With the light flyers finally getting up to speed, they are legging out a bit on the other boats with Salient +141 miles to the leader, Kraken +168, Turnagain +198, Anjo +274, Oxomoxo + 320, and in Cruising Class Serenite +310. Shannon Rae and her crew on Gemini’s Dream have reached Victoria safe and sound having suffered a failure of the furling mechanism on their main sail and turned around for home. In Racing 1, the race between Joy Ride and Firefly is still too close to call. If one of the boats climbs a ladder or slips on a snake before Saturday morning’s predicted finish, it will determine who stands above whom on the podium. But Navigators Brad Baker on Firefly and Bron Miller on Joy Ride are both being wily – trying to get a slight advantage over the other while not giving anything away. You can bet they are closely watching each on radar and the tracker. In Racing 2 it is even closer. If their current course and speed holds, Salient, Turnagain and Kraken are predicted to arrive on Sunday morning within an hour of each other. Boy oh boy! And with time allowances, any of these three could also overtake Joy Ride or Firefly for First Overall. Salient's navigator is Gunnar Jonsson is a very well seasoned winner and many time Vic-Maui veteran, but Mark Malacek on Kraken and Travis McGregor on Turnagain are doing their own navigating - and likely not getting any sleep. And while slipping just a little bit, it is still possible for Oxomoxo and Anjo to make up ground and get in the hunt for somewhere on the podium. If you want to see what the Navigators are sweating over, today’s Weather Eye gives a view of what their crystal balls might be revealing.